After starting the first composition of Loki, I just wasn’t feeling it. It seemed like I was just painting a favorite photograph rather than producing art. And so i went back to another image; one that his mom had emailed to me which I thought was a little more compelling. Back to my zooming and cropping and eyes staring at the viewer (or, eye, in this case). I like the paw in the foreground, and the peaceful expression. What is more endearing than a sleepy dog, comfortable in his bed? One thing that all artists share, I think, is a propensity for avoiding the work. It’s entirely fear-based (“I don’t want to screw it up”), and I’ve been doing it more than usual with this painting. I’m not sure why. Are we ever sure of the inner workings of our deepest, shadowiest subconscious? One of the other aspects of painting which I find really interesting (in my own work) is that I often use different techniques each time. With this painting, I am finding that I’m using a dry brush technique. This is normally counter to oil painting, which often consists of big, blobby, wet strokes. I guess I’m so reticent about getting all that blackness right and incorporating the highlights correctly that I am using the brush more like a piece of charcoal, rubbing and smoothing out. My brushes are taking a beating, but I’m comfortably creeping along. In my safety zone. I need to paint more boldly. This painting has been commissioned by a woman as a housewarming gift for her husband. It’s hard to be risky with gifts. Especially when they’re moving in a couple of weeks. I will be in the studio all day, tomorrow. 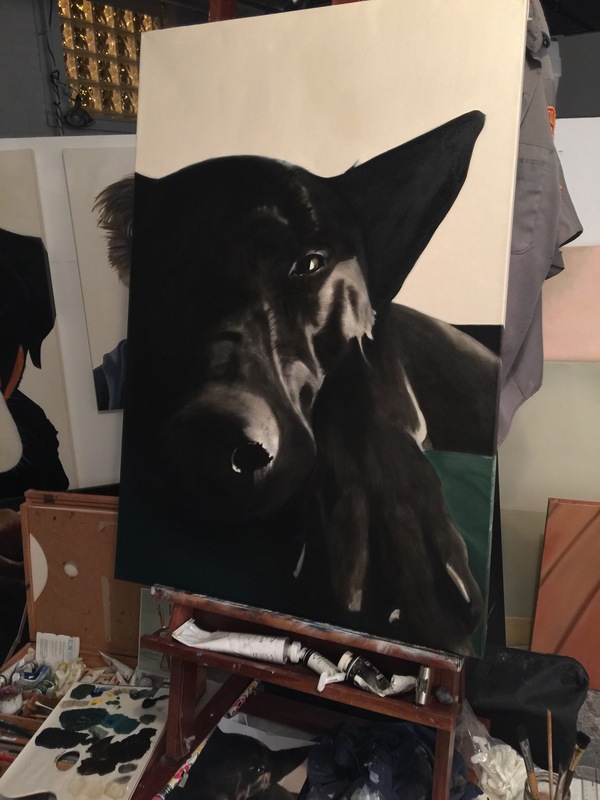 06 Nov	This entry was published on November 6, 2015 at 12:01 pm and is filed under dog, oil on canvas, portrait. Bookmark the permalink. Follow any comments here with the RSS feed for this post.